Crouching Tiger, Hidden Dragon draws its title from the Chinese proverb "卧虎藏龙," which refers to the hidden depths of talent in seemingly ordinary people. But the title also takes inspiration from the characters - or perhaps it's the other way around: the character we know as Jen Yu is actually named Yu Jiao Long; as you know, "Long" translates as "dragon" (for the record, "Jiao" means "delicate"). Jen/Yu Jiao Long was played by Zhang Ziyi, who was chosen because Ang Lee forsaw her being a star for the new decade, like Michelle Yeoh was in the '80s and '90s, and Cheng Pei Pei (Jade Fox) was in the '60s and '70s. The film is really Jen's story, as she's the one who drives the entire plot. This figure represents her in her ninja costume, and it's done very well. Like Yu Shu Lien, her chest cap has a bump to represent her breasts, and the edge of the shirt is molded in, so it has at least a bit of detail. The omnipresent black is broken up by a few red highlights, and she gets new boots and cuffs, as well. The figure's face is hidden behind a small black mask, but it's still fully painted under there. The likeness doesn't have much of a resemblance to Zhang Ziyi, but none of the faces are very good in that regard. The mask and headwrap are all one piece, so they come off together. Her hair is done up in a really impressive bun, coiled onto the back of her head. 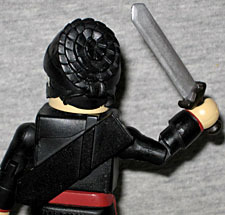 Like the other Minimates in this series, Jen Yu includes a sword - it's a very simple blade, but it stands out from the others by virtue of having a scabbard. It plugs into the back of Jen's shirt by way of a Q-shaped hole and peg, and the sword slides in and out easily. It is, overall, a very nice presentation and fun to play with. If you were only going to buy one CTHD Minimate, Jen Yu is the best: not only does she have a little more than the average sword, she has the benefit of being a cool female ninja - even Iranians love that! Plus, she's part of the inspiration for the title! Crouching Tiger, Hidden Dragon is the fourth book in the Crane-Iron Pentalogy, a series of novels that followed four generations of heroes; in the book Jen and Lo were the main characters - the film took parts of several of the books in order to beef up the roles of Li Mu Bai and Yu Shu Lien. 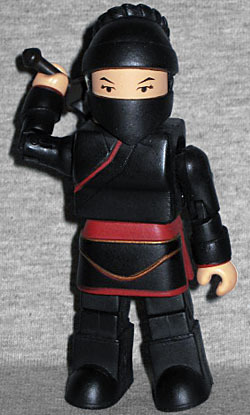 This entry was posted in Art Asylum, MMMR and tagged Crouching Tiger, Hidden Dragon, Minimates. Bookmark the permalink.